Dorms and college apartments are rarely grandiose. Such rooms are usually cramped and oddly shaped. And oftentimes the small space must be shared with a roomie or two. 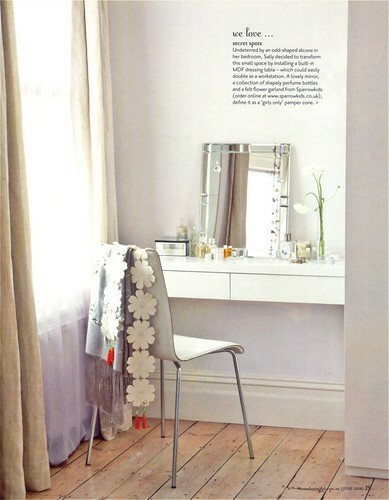 So to inspire you for 2010, here are some photos of small spaces big on style. The new hideaway bed. When you hear "hideaway bed," you're probably thinking of a bulky, heavy monster of a couch with a mattress that folds up on the inside and is a pain to bring in and out. Well, forget that concept. 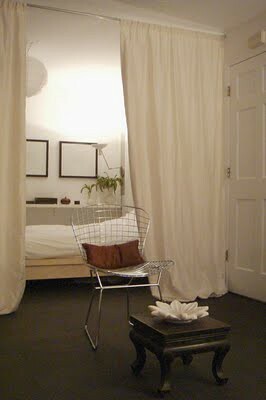 If you have a studio apartment and would like a little privacy around your bed to make it feel more comfy and cozy, hang a curtain as a divider. When company is over, you can pull the curtain shut and hide your bed. And when you're ready for a good night's slumber, curl up inside the cozy nook. Make use of every inch of space, even those odd corners. If you live in an older apartment or dorm room, the room may be oddly shaped. This can be a challenge for furniture arrangement, but take advantage of the character of the space. Odd corners and alcoves can serve different purposes depending on their size and shape. If it's big enough, you could slide your bed or couch in for cozy sleeping or hanging out. 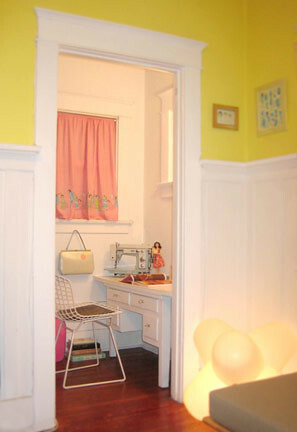 Or put a slim desk or vanity in the space (like above) for an out-of-the-way spot to do homework or make-up. 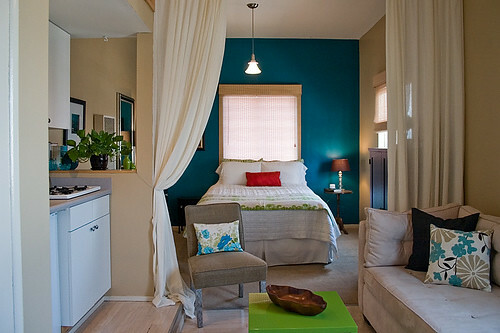 Every bit of space is invaluable in a rental or dorm, so you want to make the most of it. Instead of cluttering your place with lots of little pieces of furniture (nightstands, tv stands, bookcases, desks, etc.) choose furniture that can serve double duty. Place your desk by your bed so that it can double as a nightstand and workspace. Instead of picking a little tv stand only big enough to hold a tv, choose a more substantial piece of furniture with room for books, dvds, magazines, etc. Living in a small dorm or college apartment comes with its own set of obstacles and challenges. There never seems to be enough space. Furniture arrangement is a headache. And it feels like you're literally living on top of your roommate. But with some motivation, inspiration, and creativity, you can amp up the style in a small space. Stay tuned for more small space inspiration. Happy decorating! I'm an RA in a building with the biggest rooms on campus. Some people consider that a blessing, but it's not so for me. It's hard to make the space feel warm and homey, especially since it's pretty much impossible to carry big furniture up the stairs to the top floor (we have no elevator in our building). Do you have any suggestions? I could post images when I get back from my break (tomorrow). If you have small home space, you can use natural light to create an effect in most awkward of spaces. You can also use one style of flooring through all adjoining rooms on the same floor of the house to create a greater sense of continuity. You really maximized the small space. You did great. I find it kind of unique. These are all elegantly designed. Many people are having difficulties in arranging their small spaces. Glad that you come up with these suggestions.